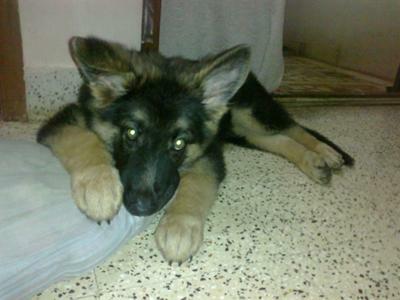 German Shepherd Puppy, Rocky updated! 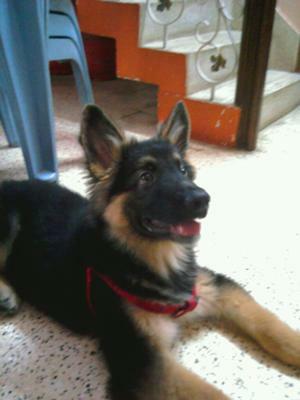 Rocky is my 3 and half month old German Shepherd (my first German Shepherd). very intelligent! He learnt Sit, Down, Stay and Hand-shake within 3 days! very very protective, even the slightest noise wakes her up! Truly happy to be a German Shepherd owner. i wanted to enroll my pup for the "puppy of the month contest"! :) pics attached..
Hey there, Srikar. It is so good to hear from you. And thanks so much for taking the time to come here and share your German Shepherd Dog puppy with us all today. And I love the pictures you have sent in to look at too - Rocky looks very comfortable just hanging out with you! He is a gorgeous little German Shepherd Dog puppy. I wish you much luck with him. So readers, send your German Shepherd puppy stories in - just make sure that you include at least about 300 words (more is absolutely fine too) or so to make the page nice and full and to brag a little about your own cherished German Shepherd. And readers - thanks so much for reading and please come back often to see what else is going on in our growing German Shepherd community. Let us know what you think about the above story by leaving some comments below. It's easy enough to do - just click on the link that says "Click here to post comments".